Until the 18th century it was often mistaken for tin or lead. Yet once refined in to its purest form it becomes a thing of great beauty. About twice as abundant as gold, the chance are you have come unwittingly in to contact with it if you have ever had a minor digestive upset. As a bismuth oxide core structure with salicylate ions attached to the surface (uh huh) you probably know it as Pepto-Bismol. 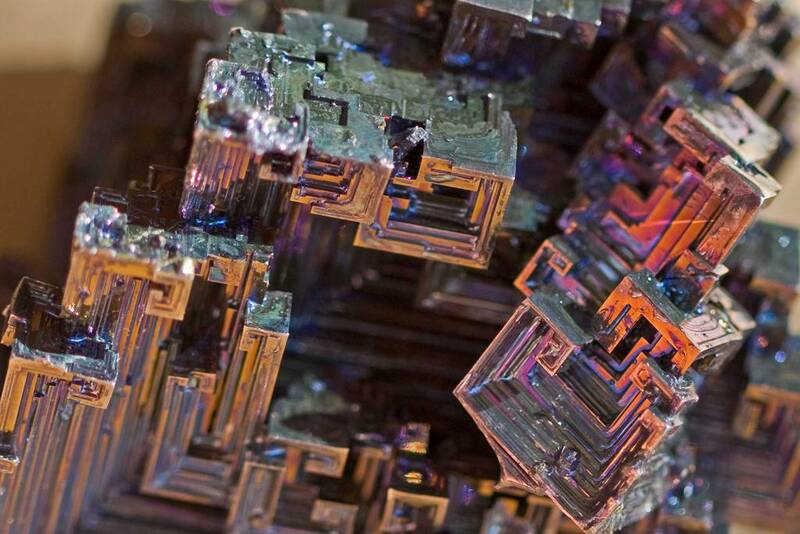 What you see here is the chemical element bismuth in crystalline form. 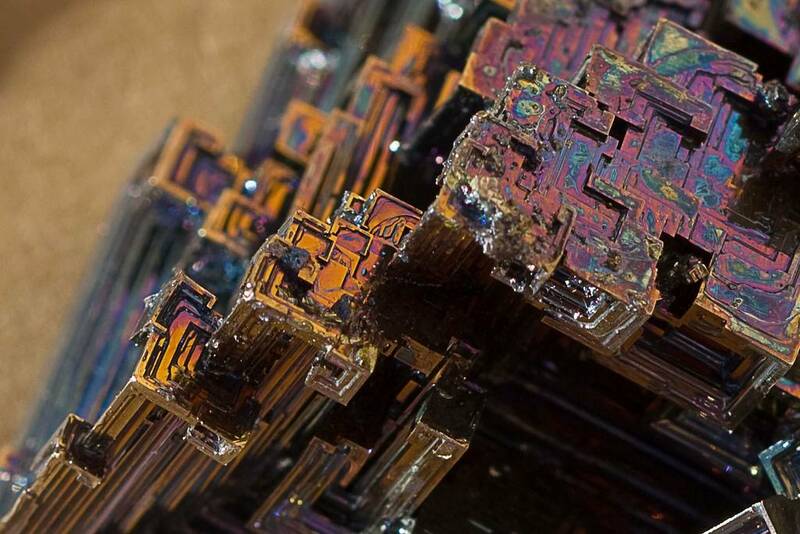 Belly aches aside, bismuth salts have been used since the 1700s to treat such ailments as diarrhea and to alleviate the symptoms of cholera. As Pepto-Bismol it has saved more than human lives. During the aftermath of the Deepwater Horizon disaster sea birds were force fed the substance to expel the oil they had ingested while trying to remove it from their feathers. 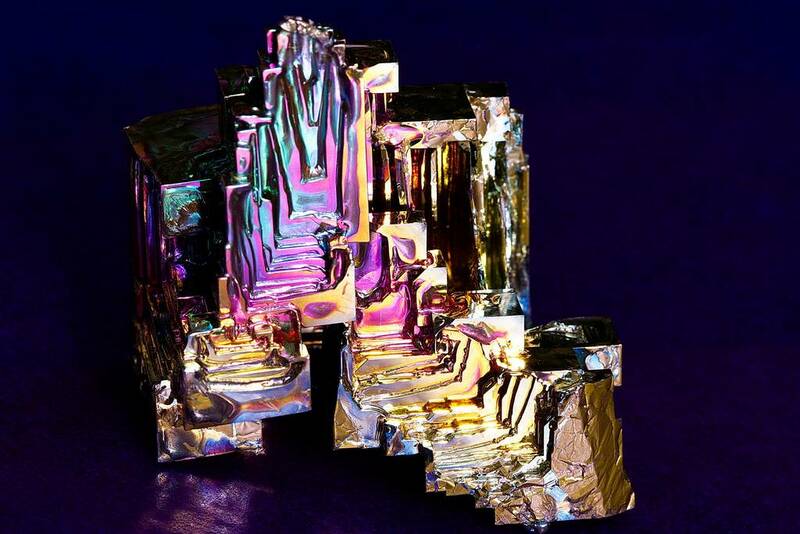 Although it has been known since ancient times the word bismuth seems to have first appeared in the late 17th century. Alchemists made some use of it medieval times. The miners who dug out the ore called it tectum argenti. This literally translates as silver being made. 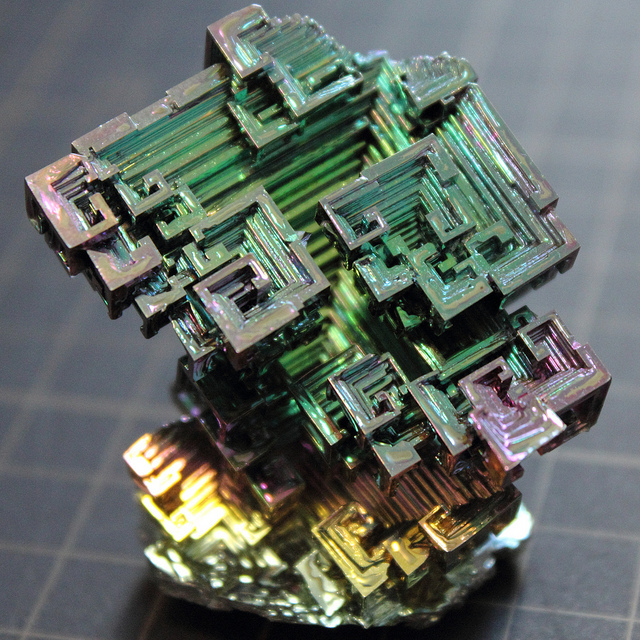 They believed that bismuth was a half-way house form of silver – in the process of being formed but not yet finished. 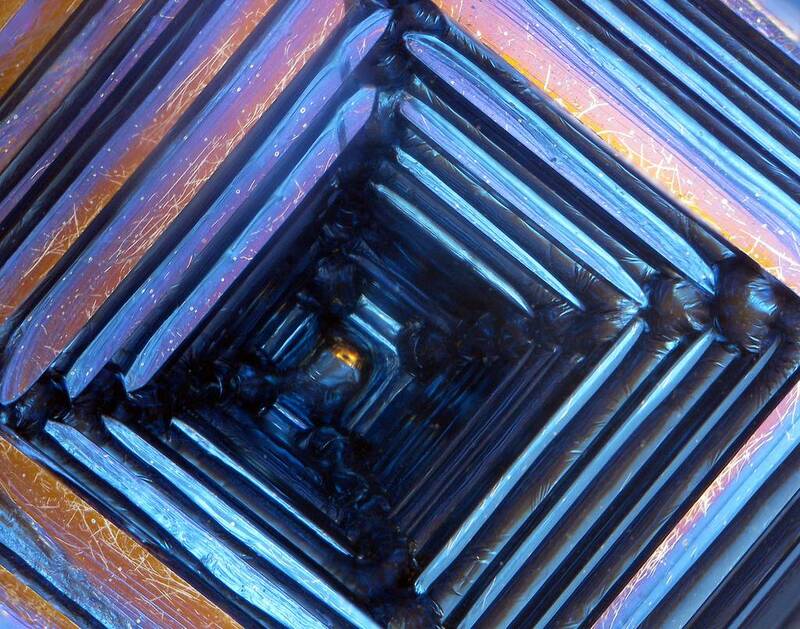 The beauty of the crystals is testament, most certainly, to why they may have thought that. 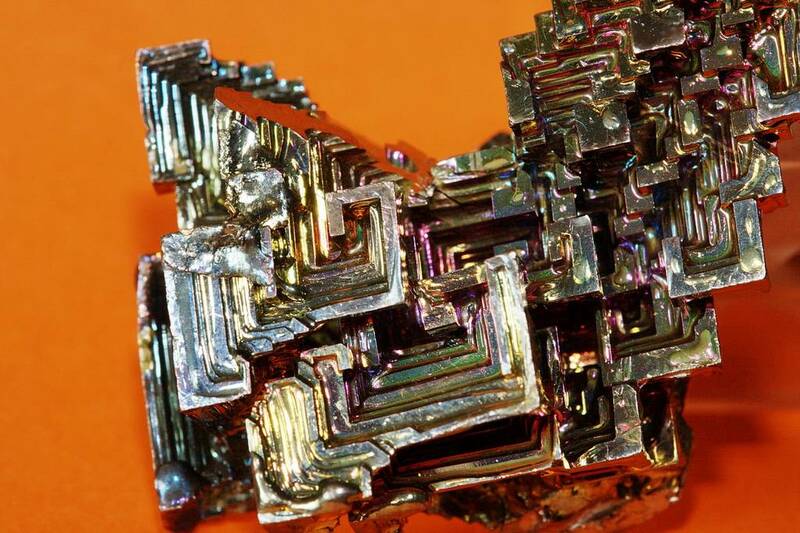 Its name is thought to be a Latinate version of an Old High German word, wissmuth, and it was not until 1546 that a German scholar and scientist, Georgius Agricola (known as the father of minerology) stated that while related to tin and lead, bismuth was in fact a distinct metal in its own right. Its use was not confined to Europe at this point: although its Andean name has been lost, it was used by the Incas as a special bronze alloy for their knives. 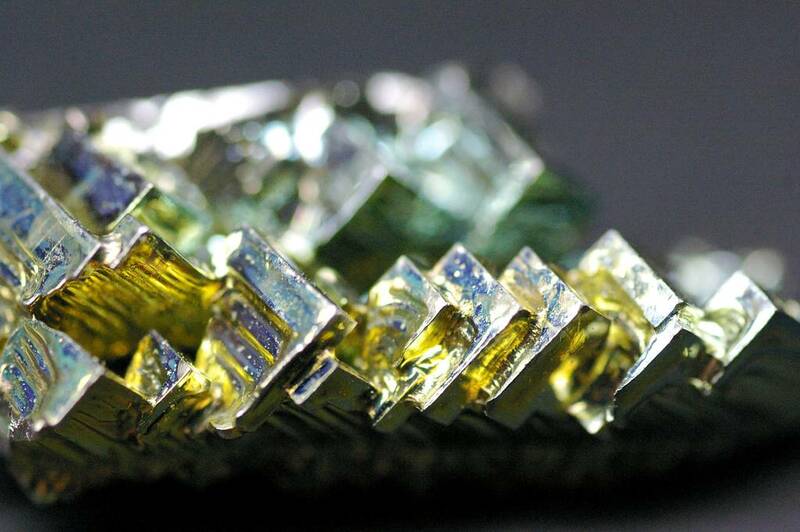 As much as it would help make Incan daggers lustrous and pleasing to the eye, this shininess is the result of iridescent oxidization – the chemical reacting with oxygen effectively. This tarnish appears as many colors, from blue to yellow and, in a post-modern twist, appears in a spiral structure. 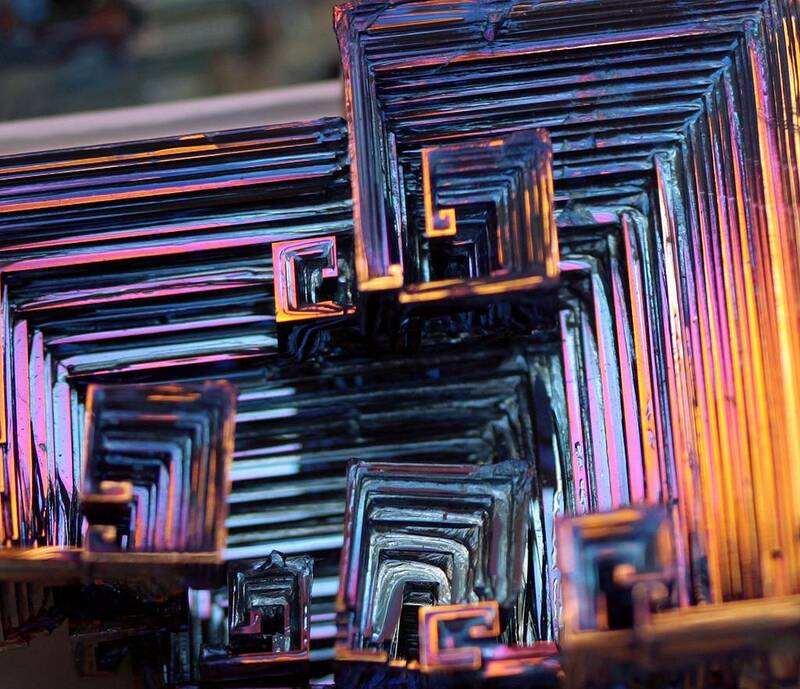 The difference in colors is due to the variations in the thickness of the oxide layer on top of the crystal. 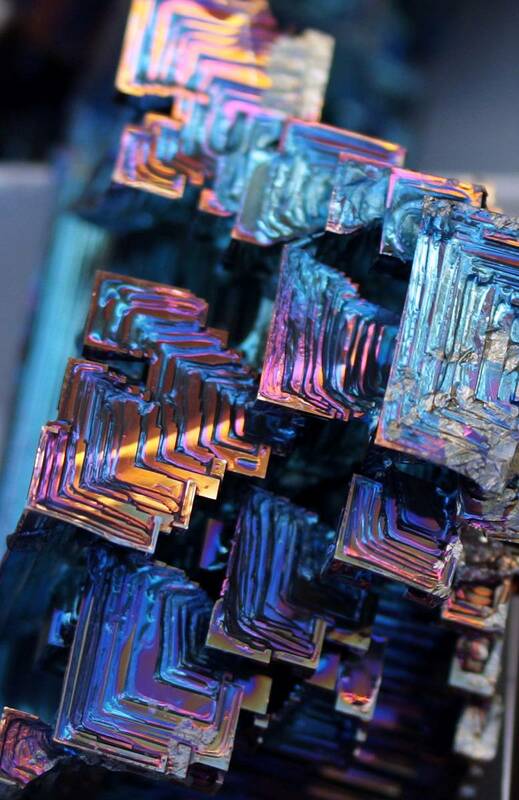 When direct light is cast on the bismuth crystals these variations cause different light wavelengths to disrupt the reflection – and so we get this beautiful rainbow effect. It has a few neighbors on the periodic table (it is number 81) which, when ingested, are not considered good for the health. These include lead, antimony and polonium. Yet although it has a high atomic mass it was always thought to be stable (in fact it was for many years considered the highest stable element in terms of mass). Nevertheless it has recently been found to be ever so slightly radioactive. Don’t worry though – it won’t kill you. 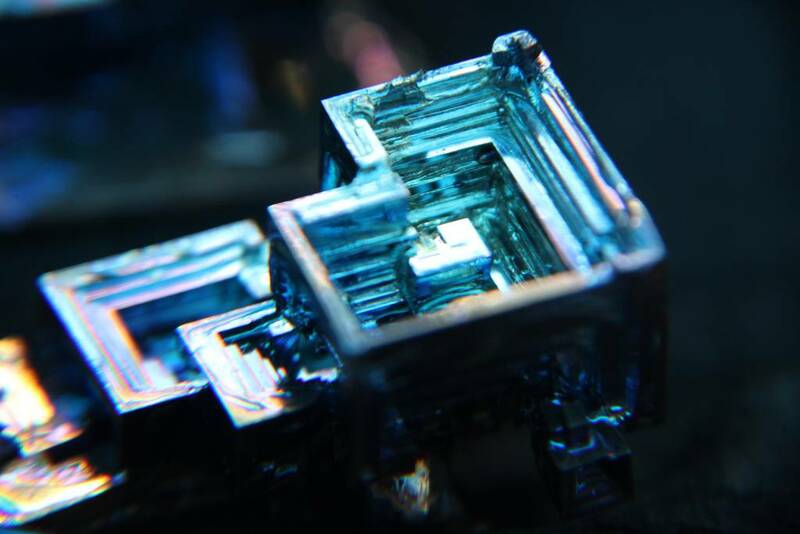 In fact bismuth alloys are fast replacing lead in products (in things like valves for potable water systems), due to its incredibly low toxicity. 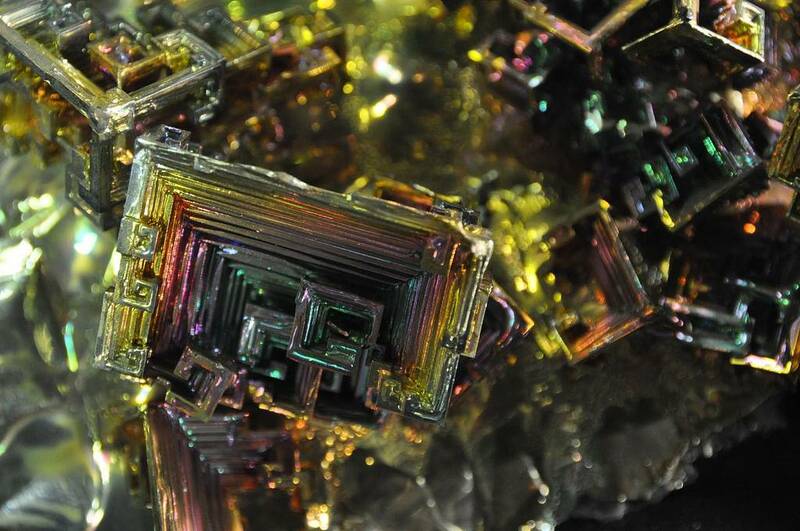 Crude lead bullion contains up to 10% bismuth and it takes several stages of refining to extract it. However, the two major processes still leave a lot of other metals in the mix. 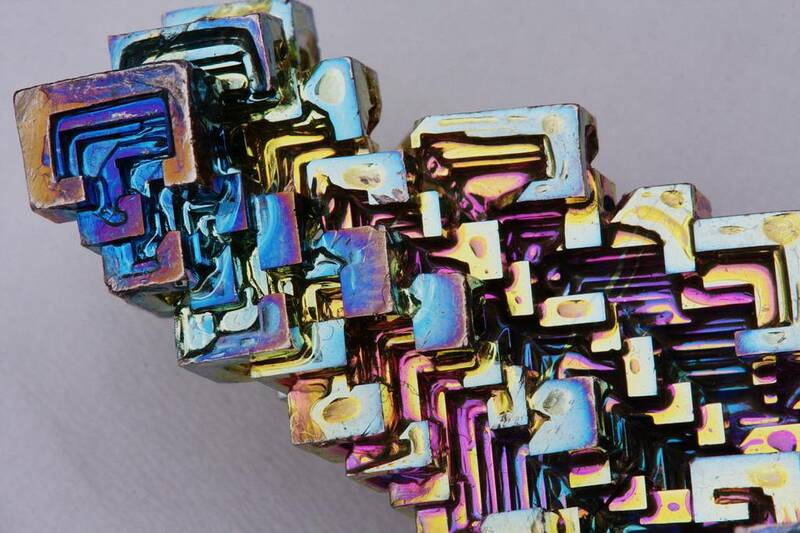 To extract the pure bismuth the processed mixture is melted and then chlorine gas is added. 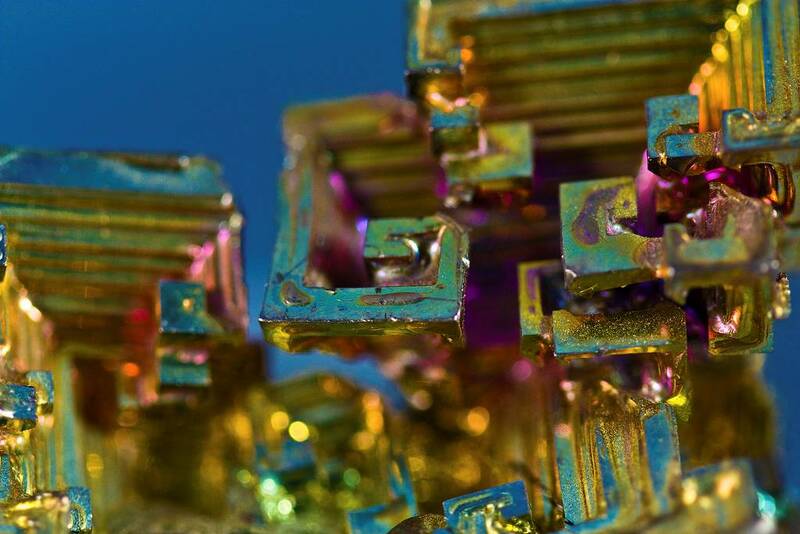 The other metals present are drawn off in their chloride form leaving behind pure bismuth. 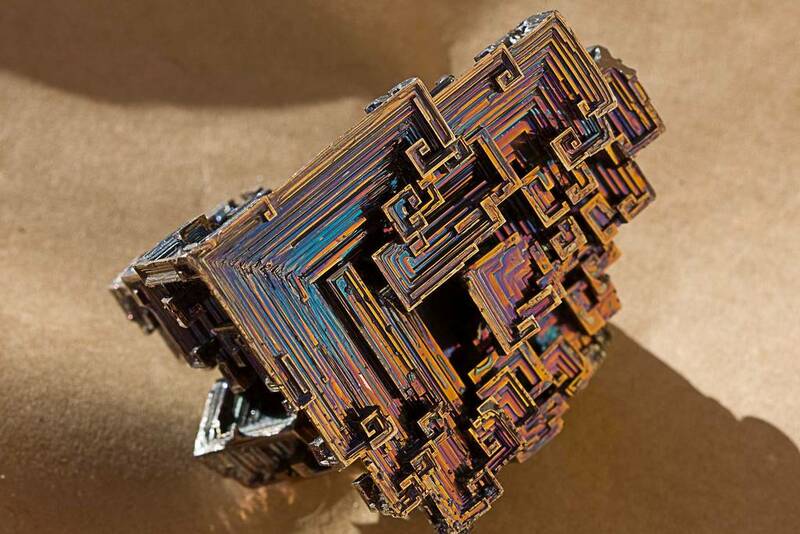 Bismuth has some astonishing characteristics. As you know, water is one of the few substances which is denser in liquid form than solid. 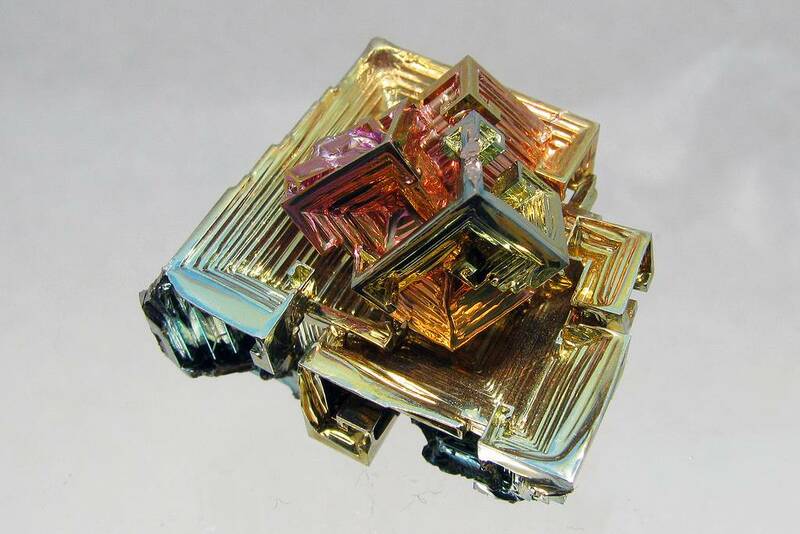 This rare phase occurrence is also true of bismuth – it expands by over 3% when it is solidified. 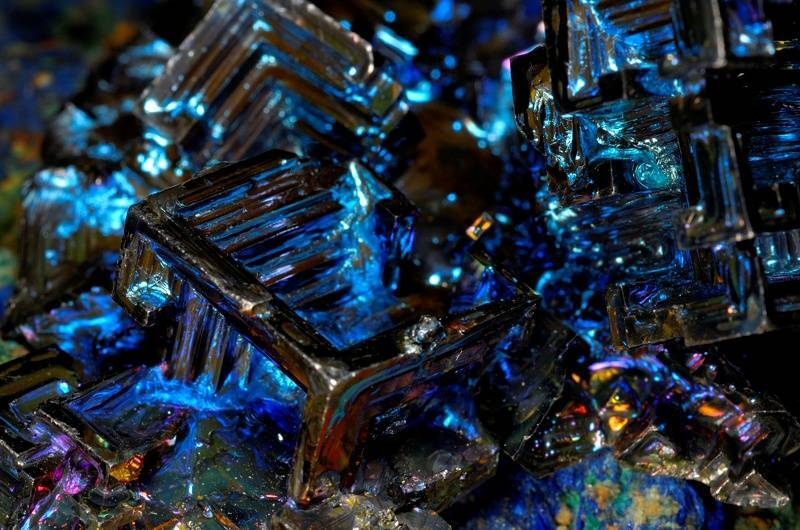 It is also more diamagnetic, naturally, than any other metal on the planet. Diamagnetism happens with all materials – it is the property which creates a magnetic field in opposition to another magnetic field which is applied to it. On the other hand it has one of the lowest values of thermal conductivity of any metal – it is an element of opposites. 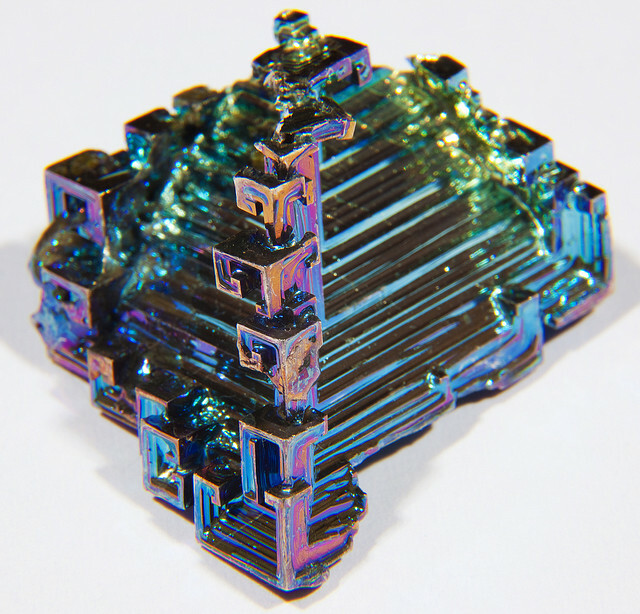 It is thought that the environmental impact of bismuth is low. This is because its compounds are not very soluble and so it is thought would not make their way in to water tables to an extent which might affect the health of any local population. 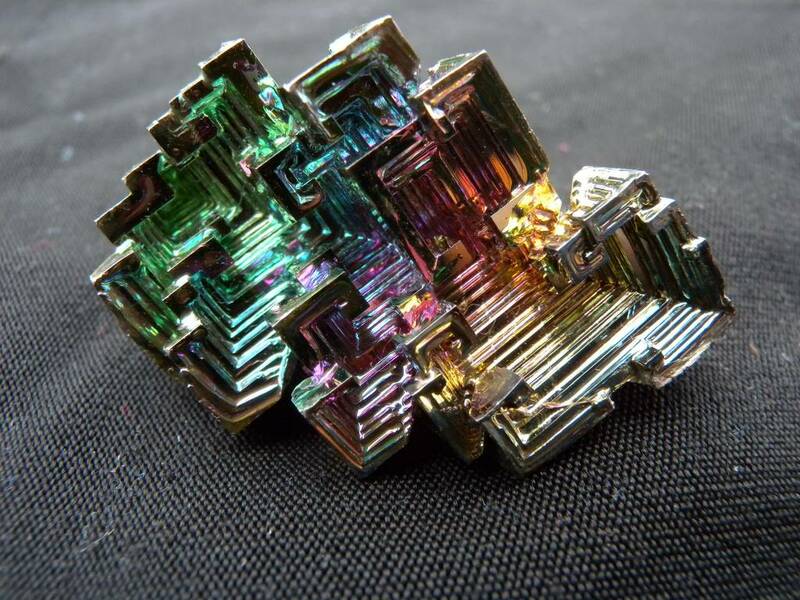 However, limited research has been done on the environmental impact of bismuth so the jury is effectively out on that one for the time being at least. 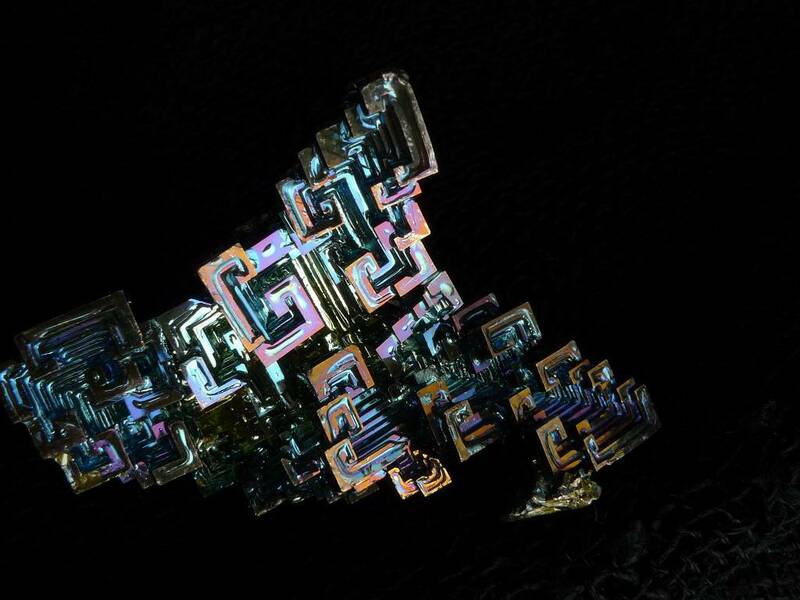 Although the bismuth crystals shown here are artificially grown as synthetic crystals they do show the element at its most beautiful: complex, iridescent, kaleidoscopic – just lovely. 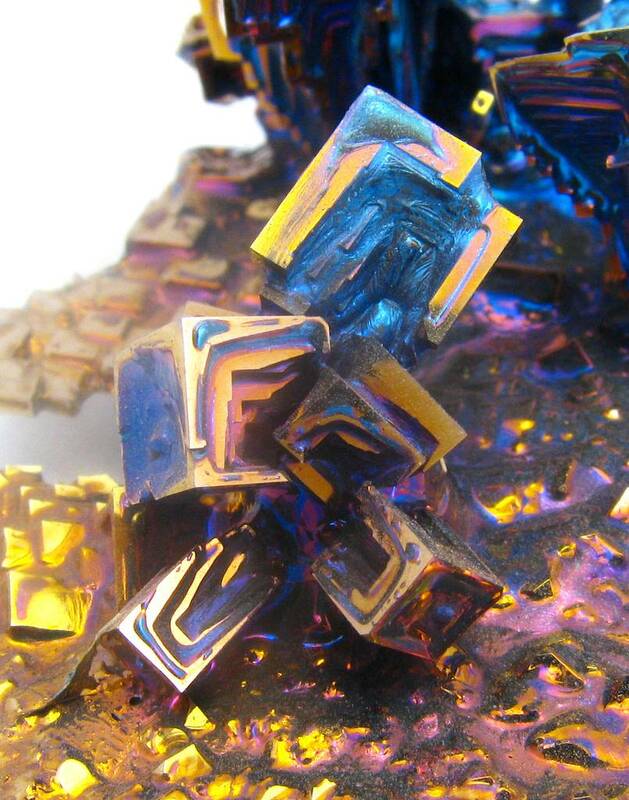 You can grow your own bismuth crystals. In order to do so you need to have bismuth metal with a very high purity, a small propane torch, a suitable container in which to melt the bismuth metal and a lot of common sense. For the full instructions, click here.